Direct Action Everywhere has recently kicked off their campaign against Chipotle. The fast food chain has recently upped their marketing to try and convince people that buying their burritos is a solution to animal exploitation. Chipotle even goes so far as advertising with animations of farmers breaking down the walls of factory farms to free the animals. Direct Action Everywhere sees the words and marketing of Chipotle as not only disingenuous but harmful. Today, Saturday January 25th is an international day of action. If you want to participate in Direct Action Everywhere’s campaign check their site to see if an action is planned near you. 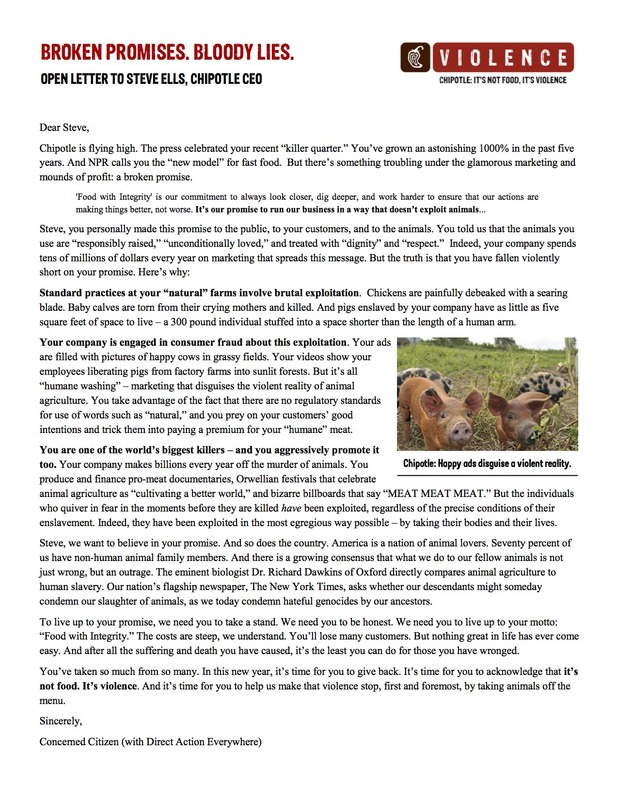 OR you can download an “IT’S NOT FOOD, IT’S VIOLENCE” poster and deliver a copy of the following open-letter to Chipotle CEO Steve Ells at your nearest Chipotle location.